Background: Mustard gas or sulfur mustard (dichloro-3-thiapentane-1,5) is a chemical compound consisting of chlorine and sulfur which was used as a chemical weapon in the First World War and during the war between Iran and Iraq. Mustard gas is a lipophilic compound that is highly poisonous and can quickly penetrate into body tissues. Eye is one of the body organs that is quite vulnerable to this compound. The present study was conducted to review the effectiveness of various treatments for ocular injuries caused by sulfur mustard. Methods: In this review, therapeutic effects of anti-inflammatory drugs such as dexamethasone, diclofenac, betamethasone and their combination, as well as surgical interventions based on stem cells and different methods of keratoplasty [e.g. penetrating keratoplasty (PKP), lamellar keratoplasty (LKP), and deep anterior lamellar keratoplasty (DALK)] were assessed. Results: As the results indicated, combinatorial therapeutic approaches are more successful compared with single therapeutic measures. It has been reported that utilization of anti-inflammatory drugs such as diclofenac, dexamethasone and betamethasone can control the initial symptoms. In addition, keratolimbal allograft stem cell transplantation methods along with LKP and PKP keratoplasty methods can lead to considerable therapeutic success. 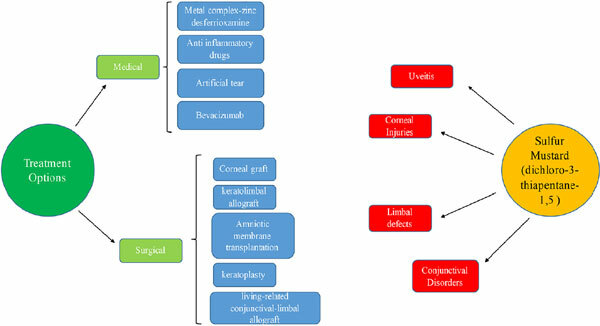 Conclusion: Considering the involvement of multiple abnormalities in the pathogenesis of sulfur mustard-induced chronic ocular complications, combinatorial therapeutic approaches appear to be more efficacious. Keywords: Mustard gas, anti-inflammatory drugs, stem cells, keratoplasty, ocular injuries. Keywords:Mustard gas, anti-inflammatory drugs, stem cells, keratoplasty, ocular injuries. Abstract:Background: Mustard gas or sulfur mustard (dichloro-3-thiapentane-1,5) is a chemical compound consisting of chlorine and sulfur which was used as a chemical weapon in the First World War and during the war between Iran and Iraq. Mustard gas is a lipophilic compound that is highly poisonous and can quickly penetrate into body tissues. Eye is one of the body organs that is quite vulnerable to this compound. The present study was conducted to review the effectiveness of various treatments for ocular injuries caused by sulfur mustard.